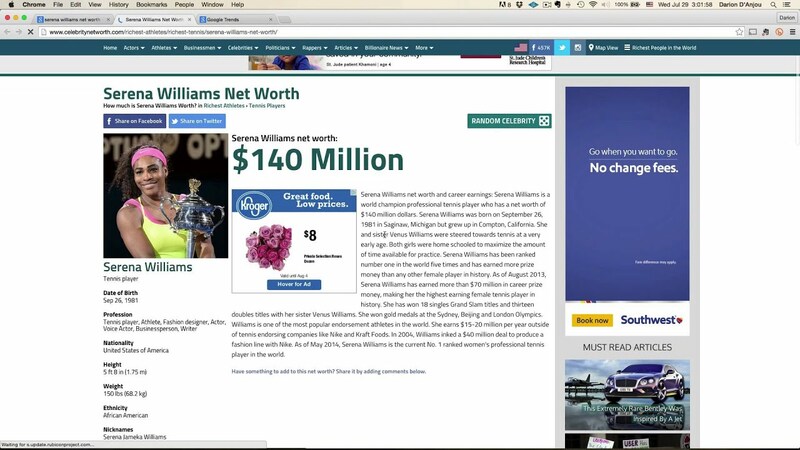 Serena Williams Husband,the trophies and Net worth of a Tennis Legend. complete the life of the star now is a Serena Williams husband.Serena has been somewhat unlucky in love and has dated some very eligible bachelors.Among the famous men Serena has dated in search of a husband are,Grigor Dimitrov,Patrick Mouratoglou,the couple dated in 2012. The interesting about Serena is she does not seem to have a type.She has dated young,old,black as well as white guys.One of the elegible men she dated in 2010 was Amar'e Carsares Stoudemire, an American professional basketball player Amar'e Carsares Stoudemire who currently plays for the Dallas Mavericks of the National Basketball Association. Stoudemire played high school basketball for five different schools, ultimately graduating from Cypress Creek High School in Orlando, Florida. In 2008 Serena and Hosea Chanchez briefly datee.Hosea also credited as Hosea, is an American actor best known for his recurring role on For Your Love and the quarterback football player Malik Wright . Jackie Long was another of Serena's potential husbands.He is an American television and film actor, writer, musician, director and producer. He is also a voice actor for Grand Theft Auto V.
Drake cheering Serena on at the tennis court. Hip hop artist Drake.Serena and Drake actually broke the net with so many fans showing interest and thinking Serena might actually marry Drake.There were rumours that she met his mother as well,but alas ,he never became the husband the fans so much craved for the tennis player. 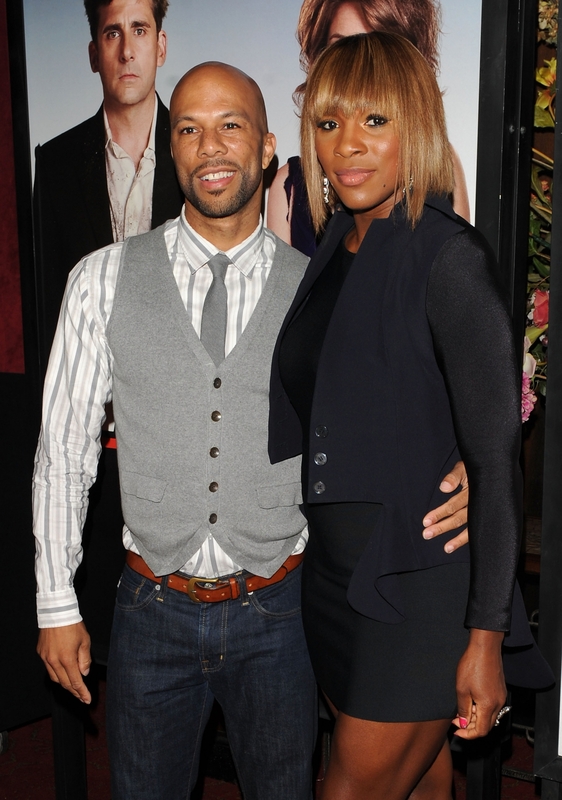 Serena and rapper Common were an hot item. Other celebrities she dated are...Rapper Common,the two were a hot item and are still very good friends today...Collin Farrell the Irish actor,Brett Ratner the American filmmaker and music video director. He is known for directing the Rush Hour film series,Joseph Keyshawn Johnson the former American college and professional football player who was a wide receiver in the National Football League for eleven seasons. So like so many successful women,Serena Williams despite dating some of the most eligible men in the world ,still can't find that elusive husband. The woman has it all,fame,glamour,success,titles and all the money in the world! Do you know what Serena Williams net worth is?This is a woman who has been at the top of the tennis world for the past 14 years since she first reached the No. 1 ranking in 2002. She has been the No 1 female tennis ranking player for the last 3 years! She became the oldest women to hold the top spot in February 2013 at 31 and has not let go of the ranking since. Serena's current run of 174 weeks is the second longest behind Steffi Graf’s record of 187 weeks and it very much looks like she is going to break that record. The sustained stretch of brilliance has made Williams a rich woman. Her career prize money of $77.6 million is more than twice as much as any other female athlete. Williams has made more than double that off the court from endorsement partners and appearance fees, and this year she did the incredible and the unheard of when she unseated Maria Sharapova as the world’s highest-paid female athlete. The result: a net worth of $150 million and a spot on the up-and-comers list of Forbes’ annual look at America’s wealthiest self-made women. So with every aspect in the tennis champions life,will she tick the husband box?Will she ever find him?Well the seven times Wimbledon champion is a winner who never takes no for an answer.Lets hope this is a fight she will win to complete her joy. On the tennis court,Serena Williams still can't do no wrong.The world No1 beat German fourth seed Angelique Kerber to win a seventh Wimbledon 2016 and 22nd Grand Slam title. Serena has had an incredible career and big sister Venus Williams who was at Wimbledon to cheer on little sister,must be so proud of what her sister who is undoubtedly one of the greatest tennis players ever,has achieved. The 34 year old American, coped with a gusty wind on Centre Court to win 7-5 6-3 and equal Steffi Graf's Open era record of major titles. Kerber had beaten Williams in the Australian Open final in January but could not produce another shock. Williams ends a losing run at Slams stretching back to Wimbledon last year. Later on Centre Court, Serena and sister Venus claimed their sixth Wimbledon women's doubles title - and 14th Grand Slam trophy - with a 6-3 6-4 win over Timea Babos and Yaroslava Shvedova. Fourteen years since she first won Wimbledon, Williams claimed the title for a seventh time after dropping just one set all tournament. The world number one banished memories of last year, when she fell two matches short of a historic calendar Grand Slam, and of losing in the Australian and French Open finals this year. "It's been incredibly difficult not to think about it," she said of finally winning number 22. "It makes the victory even sweeter to know how hard I worked hard for it. "This court definitely feels like home, I have a match later today in the doubles, so I'll be back out." Williams moves alongside German great Graf in the all-time list of Grand Slam singles champions, and just two behind overall leader Margaret Court, the Australian who won 13 of her 24 major titles before tennis turned professional in 1968. Williams had tried and failed three times to win her 22nd major singles title but she finally got over the line with a performance that owed as much to nerve as to skill. Kerber, 28, was the outsider but buoyed by her win over Williams in Melbourne, and the swirling wind added another element of uncertainty to the final. The German's serve was under pressure immediately but after she saw off three break points in the second game, Kerber managed to contain Williams for the most part with her relentless hitting from corner to corner. A pumped-up Williams roared in celebration after one lunging volley, and again when three serves got her out of trouble at 5-5, and it was Kerber's resistance which broke first. After a carefully managed 12 games the German made only her fourth and fifth errors of the set to fall 15-40 behind, before Williams converted her second set point with a thumping backhand into the corner. Kerber was not about to fold, however, finally earning her first break point of the match at 3-3 in the second set after one hour and 13 minutes - only to watch as Williams hammered a 117mph ace out wide. And moments later an engrossing final came to a sudden end. Kerber mis-hit a backhand to drop serve and Williams then powered through her final service game, punching away a forehand volley on match point and falling back on to the Centre Court turf. Steffi Graf, seven-time Wimbledon champion on Facebook: "What an incredible performance by Serena at Wimbledon. Such a gift to all sport fans who get to continue to watch her add to an already amazing career #22." Billie Jean King, six-time Wimbledon champion: "The difference was the serve, because their groundstrokes they matched up so well. "It is the most beautiful serve ever. I remember seeing Serena when she was probably 11 or 12 and her technique was beautiful and she is such a terrific athlete. "Serena hates losing and I think that is what makes her so great. If Serena can keep her motivation and stay healthy I think she can be the greatest ever. I think she is and will be, but she needs to do it." Lindsay Davenport, 1999 Wimbledon champion: "This has been the goal since Serena left the tournament 12 months ago, to get to 22 and seven Wimbledon titles. "She has been a woman on a mission for two weeks. She had one iffy match against [Christina] McHale and that was it." John McEnroe, three-time Wimbledon champion: "I do think it is highly likely that will happen [Williams overtaking Court], she has tremendous will and desire. If you want to be the greatest of the great, that is the way you have to play. "I don't see anyone on the horizon that will mean she doesn't get at least a couple more quickly." Long live the queen,there are still going to be many bowing down for the Queen and more trophies and championships as well as broken records,before she calls it a day. Additional reports by BBC Sports and Forbes Magazine rich list.